With the beginning of the season right around the corner I have decided it was time for ‘In The Crosshairs’ to do its first ever clip show. So pretend we have just accidentally locked ourselves in the cellar and are spending the time reminiscing about last season until somebody realizes we are missing. We are going to start the flashback sequence with some advice for the newbies. 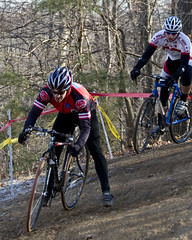 A standard interview question asked on this site concerns missteps of the new cyclocross racer. Here’s a look back at the knowledge handed down from podium finishers. What is something you saw a newbie do that made you think “I really need to have a friendly word with that guy.” This could have been in a race or in the parking lot or waiting in line to register, etc. STEVE FIFE: I see people roll to the start line cold all the time, and think it would really be helpful for them to know the benefit of a good warm up. Technique. Tire Pressure. Layering. All are important in CX. JULIE KULIECZA: I think I am still a newbie so if someone sees me doing something dumb please tell me. Pumping tires up to more than 50 psi. I did say something and they thanked me. NOAH BELL: A guy ran through a ridable sand pit every lap and on the last lap a guy rode past him and he lost a podium spot. Urban Cross 2008: Come Here Often? 1. Did you do the race last year? How did it go? JULIE KULIECZA (2nd Place Women Cat 1/2/3): … Continue reading Urban Cross 2008: Come Here Often? Urban Cross 2008: Game On! 3. Describe your winning (or losing) move. GUNNAR SHOGREN: Master’s Race-Get the hole-shot, put out enough effort to stay in … Continue reading Urban Cross 2008: Game On!